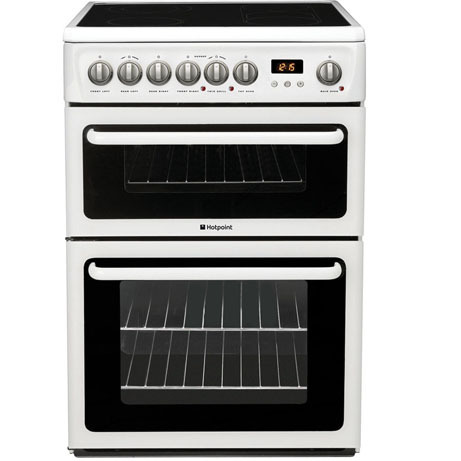 This Hotpoint Cooker with Double Oven comes in a modern white finish boasting over 100 litres of cooking capacity. This Cooker has an electric fan oven that distributes heat evenly, resulting in quicker more even cooking. 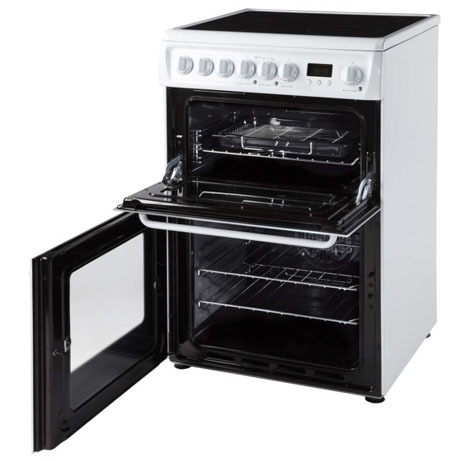 The second oven boasts a good sized 41 litre capacity and it is conventional too, meaning it’s slightly hotter at the top which is handy if you’re cooking different dishes at the same time. The second oven also has a grill to the top to give you this option of cooking also. There is an easy clean ceramic hob which is perfect for frying or boiling with ease. Featuring a catalytic lining this oven absorbs and burns grease at a high temperature, so you barely have any cleaning. Another handy feature is the programmable timer meaning you can set the cooking around your day. 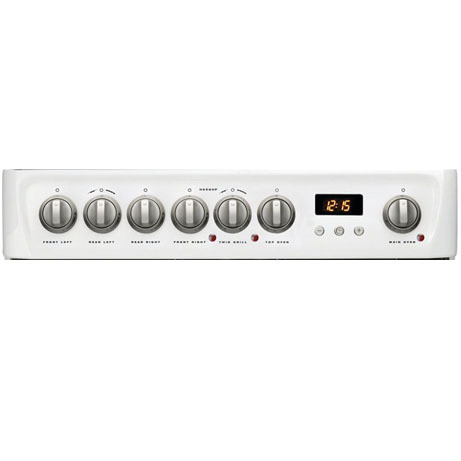 Enjoy great home cooking with this versatile and stylish white Hotpoint Electric Ceramic Cooker. With four cooking zones available on this electric ceramic hob, you’ll be able to comfortably accommodate a wide variety of pots and pans. Simple to control and providing excellent levels of heat, you’ll be able to fry, boil and sauté your favourite dishes quickly and easily. With a smooth and level surface, it’s easy to wipe the hob clean after use with residual heat indicators letting you know when it is safe to do so. The main cavity in this cooker is a large 71 litre electric fan oven, more than big enough for most joints of meat. With fan assisted cooking it makes sure that whatever you’re making is heated evenly regardless of where you place your food in the cavity. A double glazed door makes easy viewing, shelf stopper grids and fan cooling all help to make cooking with this oven a safe and hassle free experience. The second cavity is a generous 42 litre variable grill, perfect for preparing tasty meat and fish dishes. Cleaning up after cooking is simple thanks to this cookers catalytic liners. These work by using the heat of the oven to burn away grease and fats spills in the oven converting them to ash as you cook. By breaking down any stains and spills automatically during everyday use, you’re left with the simple task of wiping away the remaining residue to keep your oven clean.